Is an opal which generally mined in the Lightning Ridge (New South Wales, Australia) and has a dark grey to black body tone. 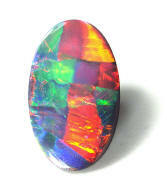 It is the most valuable form of opal due to its dark body tone causes the richness in colours. 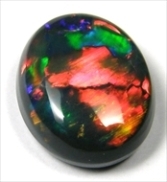 This is quite important when it comes to classifying and valuing black opal. 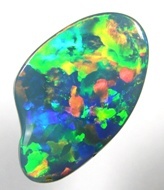 If the background of the opal (ranges from black through to light colour) is black or dark body tone, it is rarer and more valuable than the light or crystal body tone. It's dark body often relates to the richness of colours on surface. The more vibrance with darker body tone, the more desirable. N1 is the best. The degree of brightness, richness and clarity of the colour displayed by opal, when viewed face-up, is extremely important. Opalthat still shows its colour from a metre away, is considerably a bright, brilliant piece, therefore B1 is the best. 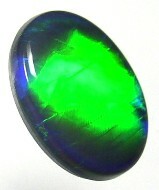 "Colour change" or "spectrum of colours" showing on opal is more valuable than an opal with only one colour and does not change or show any spectrum of colours when seeing under the light. 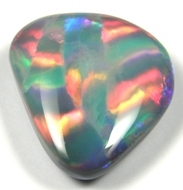 As the opal is rotated, does it change its colours and pattern ? Is the colour visible from all directions and looks amusing enough ? Opal with "play of colour"
Without much "play of colour"
There are "collectable patterns" to "not so collectable pattern" when it comes to the pattern variety. Good patterns combined with brilliant colours have an enormous impact on the value. Pinfire and small type patterns are less desirable than broad patterns or large flashes. Here are some great, collectable pattern samples. Harlequin Pattern : like a mosaic or chequerboard, packed / lined nicely. Ribbon Pattern : paralleled cascading lines of rolling colours. Flagstone Pattern : similar to harlequin pattern but more irregular and random. Palette Pattern : just like an artist's palette, with colours and imaginations. Chinese Writing Pattern : thin lines and strips of overlapping colour, resembling Chinese Characters. Rolling Flash Pattern : flash which rolls across the stone as it turns, like lightnings. Pinfire Pattern : a distinctive dotted or specks of colour is also popular. Precious opal is just like any other rare gemstones, when its carat size / carat Weight is greater, its considerably more valuable and desirable. Also it is believe to be more stable in quality. Opal with high cabochon (left) will naturally increases its carat weight and often displays more brilliance. 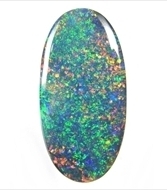 Oval, Tear drop and other regular shaped opal can bring a higher, premium price than irregular shapes (free form opal) because of higher demand in making uniformed shape jewellery. Opal with visible surface cracks, poor polish with faulty lines, potch lines (black or grey lines), windows (see through sections or lacking of colour areas), cloudy lines, sand spots on the surface, can affect and reduce the value. Some sand spots and unfinished polish can get away if they're to show on the back of opal. Please, remember that there is no standards or perfect method for valuing opals, as each individual opal is too unique in terms of brilliance, pattern, character, colours, shapes and over all beauty. Do your homework, ask questions, ask about guarantees or certificate for your opal and compare the second or third opinion from an experienced opal dealer before purchasing. If you find a piece you like and if it is a solid opal - buy it as there is no two alike.